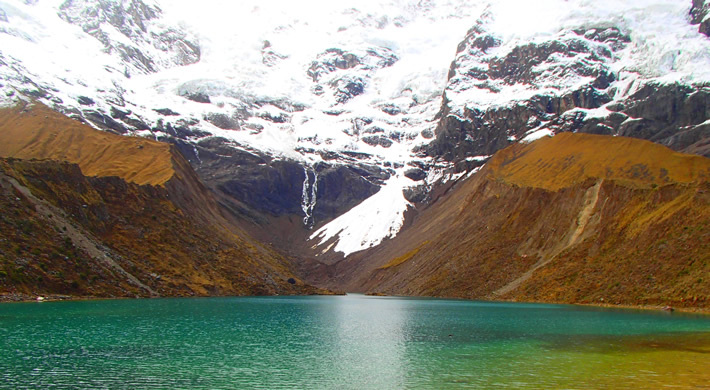 Location: The Salkantay trek begins 4 hours drive west of Cusco. 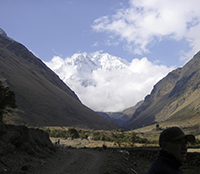 We pass the village of Mollepata and begin hiking at Soraypampa. Day 1: Cusco - Mollepata - Soraypampa - Huayracmachay. Day 2: Huayracmachay - Arrayanniyoc – La Playa. DAY 1: Cusco -- Mollepata – Soraypampa – Huayracmachay. On this first day, we will leave Cusco very early in our private transport to the village of Mollepata where we will stay for half an hour to have our breakfast. Then we continue our trip in the car until Soraypampa (3900m/12900feet). From here we climb gently for about 3 hours to Salkantaycocha. 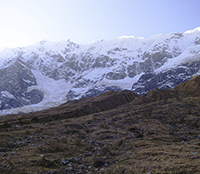 We have lunch very close to Salkantay Mountain and glaciers. After lunch and a rest we continue to climb steeply to the Salkantay pass where we will make small offerings to the apus (mountain spirits). This is the highest point of the trip (4600m/13460feet). From here we descend for 2 to 3 hours to the campsite at Huayraqmachay. Today, we continue our descent from the mountain range to the cloud forest for 1.5 hours when we reach Arrayanniyoc village. 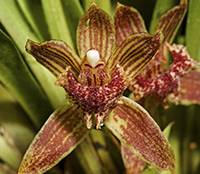 There we start about 1 hour ascent through exuberant cloud forest vegetation. Afterwards we continue the descent 4 more hours in the subtropical zone. We will take our lunch in the village of Wiñaypocco. After 2 hours walking we reach our camp site in La Playa village (2100m/6930feet). DAY 03: La Playa - Santa Teresa - Aguas Calientes. When we get up on this day, we will take our transport to the village of Santa Teresa (1700m/5650feet), where we will have the opportunity to relax at the beautiful baths of Cocalmayu. Then we continue our trek through the valley and along the Vilcanota River for approximately 3 hours until we reach the hydroelectric plant where we will have our lunch. Before continuing to walk another 9 km more along the train tracks to the town of Aguas Calientes, where we can rest in a comfortable hostal and later have dinner in a restaurant. 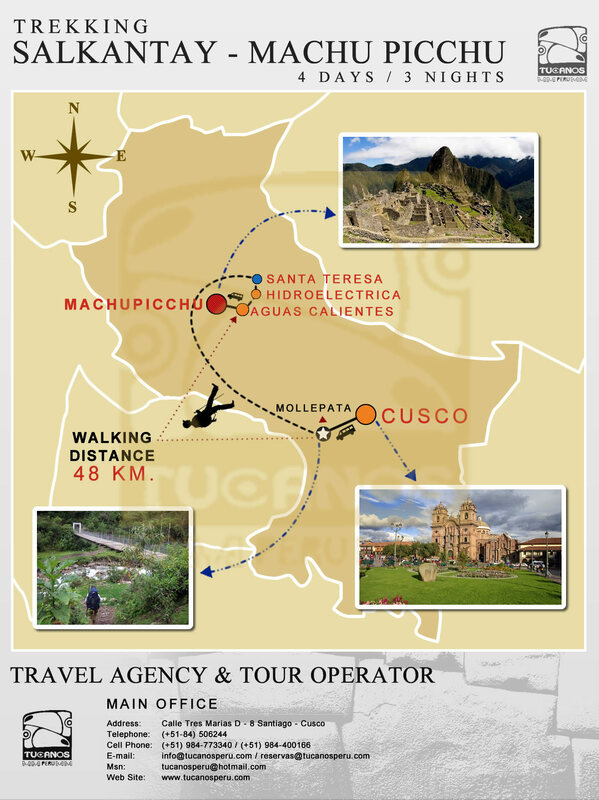 DAY 04: Aguas Calientes – Machu Picchu - Cusco. We´ll have early breakfast. 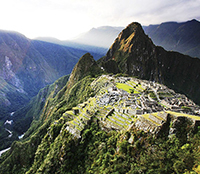 Then at 5:30 am we will catch the first bus to Machu Picchu (navel of the world) in order to appreciate the magnificent city as the sun is rising. A walking tour (approximately 2 hours) is given by your Guide and after this you can explore the mysterious city by yourselves. If you still have energy you can also climb Huaynapicchu (2720m/8980feet) it takes 45 minutes to reach the top. We can also secure your entry to the mountain of Huaynapichu from where we can appreciate Machu Picchu from a different vantage point. Later, we will again descend to Aguas Calientes town to take the train return to Ollantaytambo and then by bus to Cusco, and transfer to your hotel.